Each Sunny Buddy comes equipped with a LT3652 power tracking 2A battery charging circuit and pre-installed barrel jack and 2-pin JST connectors with unpopulated areas to install your own personal 3.5mm screw terminals for added input/output options. This revision also adds a potentiometer to the input to set the holding voltage for MPPT and we've also tweeked the feedback resistors on the output to change the float voltage. You're right, it's still a low-voltage parallel cell pack that acts like a single cell (more or less), so you can charge it with this. HOWEVER, since the maximum charge rate of this charger is only 450mA, you'll have a hard time fully charging that 6Ah cell with this during a single day. That's not to say that you can't use it, just that a smaller (cheaper) battery will likely give you as much as you can possibly get out of coupling that with the Sunny Buddy. 1&2- You can definitely attach four of these in series to charge multiple cells, but if you're not absolutely sure what you're doing, I'd steer clear of it, because you could easily start a fire doing it wrong. You want an individual solar cell for each Sunny Buddy in the system, as well. The loads should be in series but the cells should not. 3- if your load is higher than 450mA, the extra current will be drawn from the battery. If you don't have a battery attached, you'll brown out the system. 4- I have no experience with LiFe chemistry batteries. I'd refer you to the datasheet, which is linked above. It may be possible to change the circuit to charge 12V batteries; I'm not sure if that's just a resistor change or if more is necessary for it. Again, I'd refer you to the datasheet to see what the circuit for SLA charging looks like. Advice on buying solar panels for this would be welcome, as a note in the "Documentation" section. Many "12v" panels on sale include a regulator, and are powered by panels which will generate up to 22v... more than recommended for the buddy, but using a Buddy "downstream" of another controller seems daft. And those controllers, it seems fail fairly often, anyway. The power a panel can generate is clearly a buying criterion. Easy to miss how little power some panels can produce. A 14v panel would seem "perfect"... Buddy spec'd for 6-20. I saw few if any of the "common" 10v panels. Hooking two 6v panels in series might work... What Could Possibly Go Wrong? Ah... some places on the internet say that if one is in shadow, it will effectively open the circuit, and you won't get any volts rather than, say 8v. The same sources speak of "bypass diodes"... but the correct spec for such a diode... and which way to connect it!... wasn't clear to me. Could you use this with a super capacitor, assuming that it can handle the voltage? I don't see any reason why not. The charger may throttle the current in a way that's suitable for a LiPo but unnecessary for a supercap, leading to longer charge times than strictly necessary, however. .22 means 0.22OHM or 220mOhm. Hello! SO the problem I have is the battery is not charging by itself without a load. I've measured the Load voltage and the Battery terminal voltage with the panel hooked up and its around 2.1 V and i know that's not enough to charge the battery. So is there something i can do or is the unit faulty and i should order a new one? Btw my solar panel is an 18V 5W. What's the open-circuit voltage, with no battery attached? That should be pretty close to 4.05V. If it's not, you probably have a bad battery that's dragging the voltage down. 2.1V is way low for even a depleted LiPo cell. Yep as i said the problem was that i wasnt in direct sunlight. When i moved it I saw the 4.04 V . Thanks for the help! I am looking to solar charge a 3.7V/7.8Ah battery pack (http://uk.farnell.com/ansmann/2447-3034/rechargeable-batt-li-ion-3-7v/dp/2484233) and while searching for the LT3652 I found your SunnyBuddy. In the schematics, the load is connected in parallel to the battery, while on the Linear's typical application it is through a schottky diode to separate the load from the battery charge. Could you please explain why you have connected the load parallel to the battery? My idea is to allow maximum charge to the battery, while the load is consuming from the actual power source directly without affecting the charge. The schottky stops the load from sourcing current into the battery; as that's not usually a problem, we've omitted it, as it's not without cost: it reduces by one diode drop (as much as 0.5V) the voltage range across which the battery can source current to the load, and that can represent a substantial portion of the battery's total charge. Ahh.. 0.5V forward drop at 3.7V is over 13% loss - very good point. Thanks! Is it always set to 2.8V between the Set and GND? Does it depend on the Solar Panel used? I don't see from the schematics and data sheet why 2.8V is required for MPPT. What is that 90% of? Yes, it's always 2.8V. That's the voltage the MPPT will attempt to keep on that pin, and it's the scaled voltage of the solar cell's output. When the cell is at peak efficiency, if you set that pin to 2.8V, the output will servo to attempt to KEEP that value at 2.8V and thus, to keep the cell's operation at peak efficiency. Can I use secondary barrel jack to charge the battery using USB power? Can I do this parallel with solar charging? Not easily. You'd have to put some kind of diode inline with both supplies (the PV and the USB) to stop the higher voltage of the two backfeeding current into the lower voltage supply, and that would decrease the efficiency of the PV supply. There's no easy provision for doing that on the board, so you'd have to hack it into the cable or cut traces on the PCB. Please remove references to MPPT, this chip does not actually do MPPT! The reference point is hardwired in, and assumes a maximum input voltage under full sun conditions. The only way to do true MPPT is to periodically let the solar panel voltage float open circuit (while running from battery) and then load the solar panel at ~80% of that open circuit voltage. Otherwise you are not getting maximum power from your solar panel. This is what the BQ25570 does, please use it instead! Should the charger work if powered by USB as opposed to solar? It only seems to be drawing 3mA from my power supply and I am confused as to why it isn't higher? It needs a minimum of 6V to work properly. Okay, thanks for this. My solar panels seem to be giving open-circuit voltages between 4.5V and 6V. Do you have any recommendations of where I should look for preferable solar charger? If you have more than one solar panel, you can stack them by adding another barrel jack and adjusting the solder jumpers on the board. Is there any advantage to using the "two sockets/adjusting solder jumpers" beyond mere mechanical considerations? If you follow the instructions I linked above, you'll be adding a second panel in series with the first. I think that's advantageous because a partially shaded panel won't act as a load on the other panel, as would be the case with parallel panels. Unfortunately I only have one solar panel. +1. I would also like to see the NTC pin connected to a header. CHG and FAULT are both open-drain active low devices, so they can't drive an LED high. You'll need to connect your LED anode to a supply voltage (say, VOUT), and then tie the cathode to the CHG or FAULT pin (through a resistor). Could I use CHG and FAULT somehow to set pins on an Arduino (specifically an Electric Imp) high or low, so I could get informed about the state? Yes; the outputs are open-drain, so you'll need to either enable a pull-up resistor in the firmware of the target device or add an external pull-up resistor. 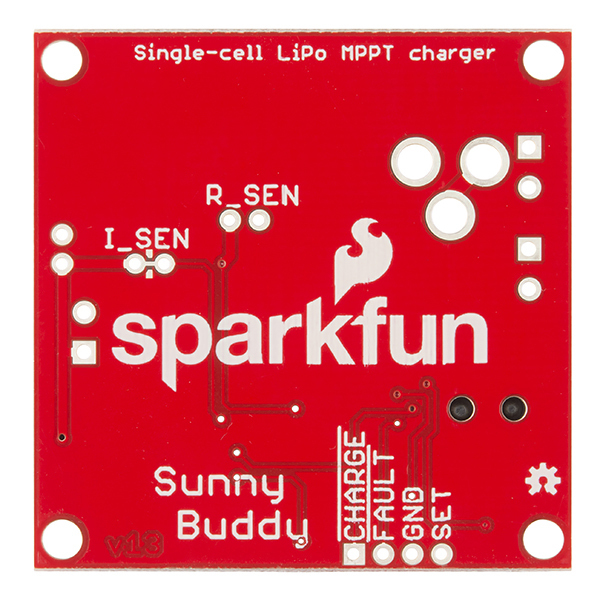 Does the Sunny Buddy prevent the lipo from being run at too low of a voltage? and if so what is cutoff set to? Thanks! It does not. It is charge limited, and has a high-voltage cutoff, but for low voltage, it relies on the protection circuitry of the cell, if it has any. I've been looking for a nice, clean way to power some 5v gear with a LiPo and Solar. The best I've been able to come up with is the SunnyBuddy and a LiPower. Any better suggestions? 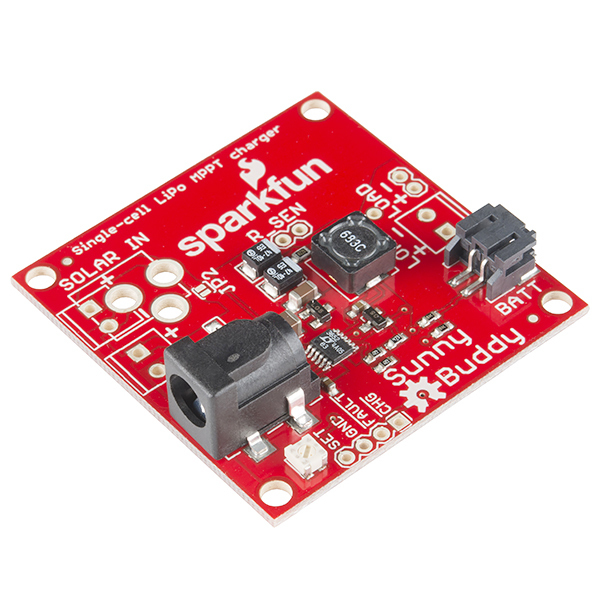 Would SparkFun consider a version of the SunnyBuddy with integrated boost converter? That'd be awesome! As for the integrated 5V boost, that's tough. There's a large body of existing stuff that wants 5V, but things are also generally moving towards 3.3V, too. You can get them from the Eagle file attached. Does anyone know of any way to get the charge status? For my project I need to be able to know how charged to battery is and send that to a microcontroller. If the solar panel is producing zero voltage or is disconnected will the load pin draw from the battery? The current will be very small. You can find exact number in datasheet, page 3. Hmm... I looked at the hook up guide and it said the load can't be too heavy. I was going to make an iPad charger out of this. The only problem with that is for an iPad to not take a day to charge ;) I need to supply the iPad with 2 amperes (roughly how much the wall adapter supplies). Is 2A too much for this board? Hi, Thank you so much for sharing this awesome product ! I have two questions: 1. Is Sunny Buddy compatible with this 12V 10W solar panel http://www.sunstore.co.uk/12v-10w-Monocrystalline-Solar-Panel.html ? 2. Can I use the default electronic design of Sunny Buddy for charge single Lithium ion polymer - 3.7v 2000mAh ? It should work fine for that panel. As for changing the charge current, you'll need to adjust the inductor and possibly the diode, but generally it should be fairly easy to adjust. Hi, I connected two solar cells of respectively 4V and 44mA@pmpp in serie to obtain 8V in order to plug them in the sunny buddy, to charge a 850mAh 3.7V battery. But when I set Vset at 2.8V in full sun (the solar cells then deliver ~9V), I only observe a charge current of 7mA (battery is at 3.9V so not entirely charged). Can someone please explain me why I only have 20% of the th. pmpp current at sunny buddy output? The part dials back the charge current based on the cell voltage, and attempts to keep the cell voltage at around 4.0V (derating the upper limit improves battery life). That may be why you're seeing that. Try with a more deeply discharged battery. I just measured and my solar panel actually delivers 22V on a real sunny day. Is that too much for this Buddy? If so, what would be the easiest way to bring it down? This should be fine; the input is rated to 30V and the capacitor on the input is rated to 50V. Could you use piezoelectric elements (with respective power management) replacing the solar panel? Most likely not. I doubt it's got the efficiency and the impulse handling capability for that. Have you looked at our energy harvester board? Hi there, I have purchased 2 sunny buddy's as I have a 2 cell Li-po battery and I was told I could use 2 sunny buddy's in series to charge the battery. I am a little confused to how the circuit would go, as there is not a diagram for this on the data sheet. My 2 cell battery has a balance charging lead consisting of 3 wires, and a discharge lead consisting of 2 wires. I have 2 solar panels each for one MPPT, but would i connect each MPPT to the batteries balance lead with a shared ground? And then how would I go about taking to load from the battery? Would it come from the batteries discharge lead or would it go through the MPPT's load port? The load is a single motor, the need for 2 cells is due to the 7.4V needed for the motor to operate at the correct conditions. Many thanks, Sacha. Neither the panels nor the Sunny Buddies share a ground. Connect the solar panels independently of one another to the sunny buddies, then tie the ground of one Sunny Buddy to the V+ output of the other. That connected node then gets tied to the connected node between the two batteries, and the unconnected ground of the low side sunny buddy gets connected to the black discharge wire. The red discharge wire should be connected to the V+ on the high side sunny buddy. Given that you have a 2S battery, I'm not sure that the "center" wire on the balance connector is, in fact, just connected to the middle of the battery stack. If there's something else in there, this isn't going to work. A far better way is to get two individual LiPo cells and connect them up. I've bought this product and I'm wondering if I can charge a lithium ion battery 4.2V with Sunny buddy? I know that it is design to charge lithium-ion polymer battery type not lithium ion(Li-ion). If so, should I change R2,R3 and R6 resistors to get 4.2V? It should. The 4.0V float voltage was selected because that prolongs the life of the battery; you can change those resistors to get to 4.2V if you really think it's important, but it gains you very little extra energy. Hola, I have a sunny buddy and plan to regulate the output voltage of three 12V 5W panels in parallel (0.125 A) to 5V 3A to charge two power banks. 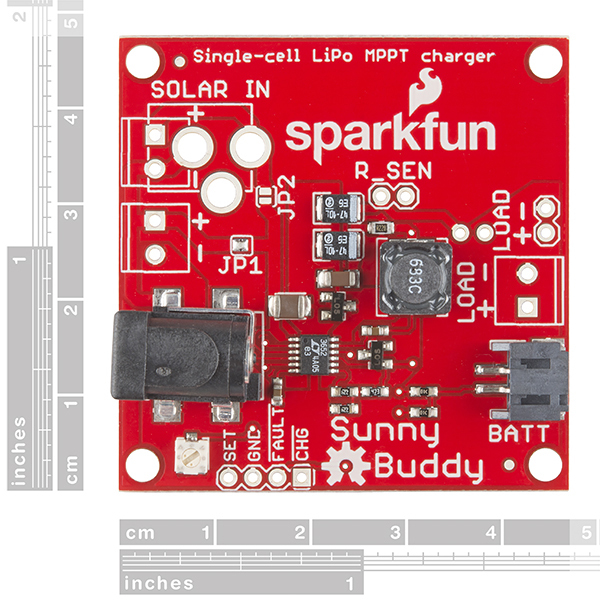 Is it possible to INCREASE the output current of the sunny buddy to 3 A? If so, how? Guys, great product! I have 4 of them working perfectly! Just a question, what can I do in order to set the charging voltage from 4V to 4.2V? Which resistor in the eagle file should I change? R2, R6, and R7 all need to be adjusted, and the directions for setting those values is in the datasheet. hi there, in the data sheet, it says this can be used to charge a 2s liFePo4 and has a circuit diagram with a solar panel inputting the voltage. I apologise I only have basic knowledge with electronics, so is that diagram showing what resistors, capacitors etc which would be needed to make this work with a 2 cell battery? Cheers, Leon. Yes. Take a look at our schematic and change out the components to match what's in the datasheet and you'll have it. I'm not a big fan of that sort of charging, though, because the cells can become unbalanced, resulting in overcharging of some cells and undercharging of others. Brilliant, thanks for your quick reply, ideally I would like to charge a 2 cell lipo battery, but there is no diagram for that modification. Would that be possible? I would of thought the cells just need a higher charging voltage supplied. This setup would only be charging the battery occasionally, it would be balanced charged the majority of the time. Thanks, Leon. There's a diagram for a 2-cell LiPo from 12V wall adapter that will work; the only difference is the set voltage of the input side divider. That you'll need to figure out based on the solar cells you're using. Raising the voltage is one part of the equation; however, for best results you want to balance the cells continuously. Charging is really a current-mode operation, rather than voltage mode: you push a certain current into the cells until the voltage of the cells reaches a defined set point. Say the set point you want is 4.0V per cell (a decent target; below 100% but it'll give you a bit more life). That's 8.0V when you have two cells. Without some extra circuitry, you have no way of knowing whether that 8.0V is 4.0V and 4.0V or 3.95V and 4.05V or whatever. It's a guarantee that one of the cells will charge more slowly (or less efficiently, if you prefer) than the other. Even a small difference will add up over time, and eventually, you'll have one cell well ahead of the other. At some point, one of them will be at the maximum healthy level for a LiPo (4.2V) while the other is still low enough that the sum will be less than the set point of 8.0V we chose earlier (i.e., 3.8V or less). The charger will still be pushing the current in, trying to get the sum voltage up to the set point, and then you can have trouble. Either the safety cut-off trips and you get a partial charge, or the "good" cell (the more efficient one) pops. Either way, it's not what you're after. Nice, I am going to go with the 2 cell lifepo4 setup. I have been looking over the diagram for that and I am a little confused, I apologise I am a aero engineering student and my electronics skills aren't great. The diagram for the 2 cell lifepo4 shows the resistors and diodes etc, do they need to be on the circuit board in place of some existing original components? Or are they connected outside of the board. I'm confused if the pin diagram represents the chip on the board or the board itself. I cannot see the wiring diagram for the original board on the data sheet. Also I'm finding it quite difficult to find some of the really specific resisters like 542k 459k and 0.05k. Thanks Leon. Hi there, I am partaking in a solar powered model aircraft project for my dissertation. Basically I am using a 3s lipo, but i do not need to charge it as my motors draw will be more than the power produced by the solar array. Therefore I need to draw all the current from the solar array and some from the battery. Does this device allow to do this if I had a 1s lipo? What could I do to allow this configuration on a 3s lipo?. Many thanks, Sacha. You could use three chargers and three solar cells, one across each cell. 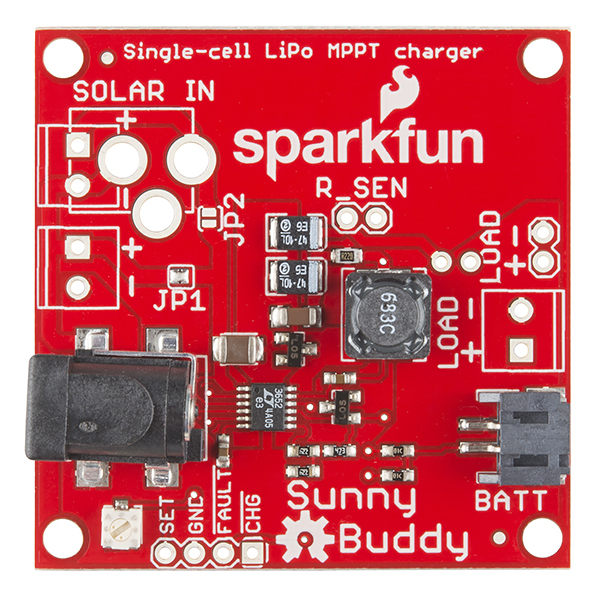 It's possible to redesign the circuit on the SunnyBuddy to charge up to 3 cells in series but that would require changing a number of components. See the datasheet for more details on that option. Is the V_set adjustment to do with the Vin Regulation and why are we setting it to 2.8V? Do I need to adjust this to 2.8V first and then adjust pot to get maximum current at JP3 current monitor? Thanks! The SunnyBuddy will servo the output current in an attempt to keep the input current at a level where the value at that pin is 2.8V. It will never, however, source more than about 400mA to the load. Your best bet is to put a depleted LiPo on the SunnyBuddy, to max the charge current, then go out in full sun and tweak the pot until the sense voltage is at 2.8V. I have a 11.1 v lipo battery that I need to connect to the mppt but the battery has a 4 pin lead instead of a two pin one so I can't connect it. Is there a way I can make this happen? Probably not. The SunnyBuddy only puts out up to 4.0V, so it can only charge a single LiPo cell. What you have is a pack of three cells in series. Hi there, is it possible to charge a 1s lipo battery with this whilst discharging it? If so how would it be connected? Many thanks, Sacha. Connect the load to the load header and the battery to the battery header. To prolong the battery life. It is discussed above in the comments, check it. Not easily. If you use two solar panels and two Sunny Buddies and connect them only at the batteries, you can charge the two batteries independently of one another. Another possibility you may want to consider is using something like the LiPower boost converter to achieve your 5V. It'll sting you a bit on efficiency but if you're careful you may well be able to handle it. I've built a power bank (solar buddy + battery + usb power boost) but I can't take much power out of it because of the small battery I have. Is it worth putting a "Polymer Lithium Ion Battery - 3.7v 4000mAh" on the solar buddy? If so is there a single cell battery with even bigger capacity? Yes and no. We have a 6Ah battery pack which has the cells in parallel, so they can be used with the Sunny Buddy. Bear in mind, however, that under ideal circumstances, the Sunny Buddy only pushes out about half an amp. You can boost that a bit with a new current sense resistor but you're unlikely to be able to fully charge the 6Ah battery in one day, unless you're in the extreme north or south during summer. Thanks for the quick answer. Of course I was not expecting to charge a 6Ah battery in one day. But at least it would "use" as much energy as possible through 1 / 2 days and I would be able to charge more power hungry devices with it, right? There's a ceiling to the amount of energy you can burn in one 24 hour period- there's no point in putting a battery larger than that on your system. 4000mAh is about at that limit. Can I use a battery like this one with the solar buddy? 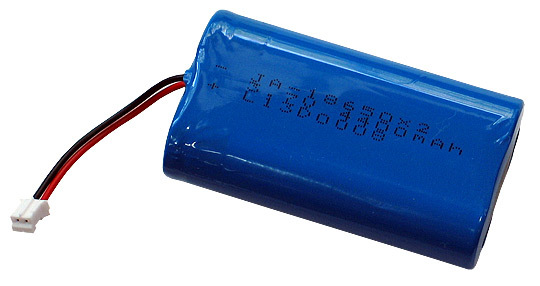 BATTERY-LIPO4400mAh. The Seller says it has the cells in parallel. Probably, if it's a 3.7V pack. Does the sunny buddy normally make a high pitched whine while charging? I just hooked mine up to a 2000mah battery, a 2w panel (~6v, 333mah) with a spark core as the load and the SB board is pretty loud. I have tried different, smaller panels and the whine is about the same. We've noticed this; it's harmonics from the switching regulator causing either the coil in the inductor to vibrate or the ceramic element in one of the capacitors to act as a piezo element. It's annoying but harmless. You could try dampening the vibrations of either element with a little epoxy. Thanks for the reply, it is a bit annoying, but glad to hear it's not anything bad happening. I tuned the voltage set potentiometer a bit and it immediately went away. After chatting with "Allison" (who was very helpful) I should make a point on this item: Yes, you can use an 18650 BUT It will discharge into oblivion if you don't have a protection circuit for the cell! And there is the potential for over-discharge-current (over 1C)! This is intended to be used with a cell that HAS PROTECTION CIRCUITRY ALREADY ON-BOARD, or you have to provide it yourself! What I would like to see is a version of this board that has a cell holder for an 18650 and that has the protection circuitry built into it for that kind of cell (not to replace this item, but as an alternative). 1) What are the specs of supported solar panels? The hookup guide says the SF small panel will work but that's listed as only having a 4.5V / 100mA output. How will that work if the minimum voltage rating for this board is 6V? 2) Since the maximum charge current is 450mA, does that mean that only panels supplying less than 450mA of power should be used? 3) Is it possible to use this as a general LiPo charging circuit, if the solar input is switched out for a wal-wart supplying >6V? If this would work, what would be the maximum current that could be supplied? The specs of the supported solar panels are 6-20V. You can stack the small Solar Cells (make sure to reconfigure the jumpers as directed), and be good to go. You can use panels that have a supply greater than 450mA, but the Sunny Buddy will only pull 450mA. As long as you keep it under 20V it should be good to go. I am using the sunny buddy regulate the output voltage of two 12W 5V panels in parallel to charge a 3000 mAH powerbank. Does it make sense to replace the Rsense value with 0.22 ohm so that I get a output charge current of 0.9 amp? You may find that at 900mA your power inductor starts to saturate. That's dangerously close to the 1.05A spec limit of the part. Also, 5V is too low a voltage; the SunnyBuddy won't start up below ~6V. Put the panels in series, and you'll probably be okay; in a step-down system, the inductor current shouldn't be too much higher (if at all) than the output current. Hi! I want to charge a 6V Lead acid battery using these, I was thinking on changing the voltage divider values to get the one required. Do you think I can desolder this resistors and put instead a trim pot with a higher resistance value? It's not quite that simple. Please refer to the datasheet on circuitry changes needed to adopt this to charge a lead-acid battery. I think it can be done but you may need to change more than just the feedback resistors. I bought this board to use with the Large Solar Panel from this site. It's been really interesting to experiment with. The flexibility of the footprints on the board is really nice because it allowed me to attach terminal blocks to the inputs so I could connect the panel voltage to one and a current sensor to the other. Great! One suggestion for this board: consider adding an independent voltage input to the set pin so that the MPPT can be managed by a controller. This part was used in a company project in Cheyenne, Wyoming. For the month prior to its installation, we'd been having trouble with power outages of the project, a solar-driven sensor, and finally a decision was made to massively boost the power supply by a factor of 10x to provide enough electricity. However, that meant using solar panels with a nominal voltage of 25 volts and a maximum current of 6 amps. The datasheet on the driving chip mentioned a max input voltage of 40V and a nominal input voltage of no more than 32, so all good there. It also mentioned that the charger only allowed switching current until the voltage on the SENSE pin was reached. I'd soldered a 0.075 9W resistor into R_SEN, limiting its current output to a max of 4.5454 amps (exceeding the output current) and proceeded with the assumption that the IC would automatically limit its output current even if it could produce more. I was correct. Though the current output reached the inductor's saturation levels and thus stopped it behaving like a true inductor, the Sunny Buddy caught the passed-through voltage and cut off the power supply (thus preventing the 25 volts from hurting anything on the output side). It's exceeded my expectations in performing and, to give all those out there an idea of how robust it is, is currently connected to a 100W solar panel display and a 6600mAh battery (along with the load). So long as you don't exceed the maximum recommended voltage input don't worry about the current drawn; the Sunny Buddy automatically limits that. It's much better than the current Adafruit solar charger and will be my go-to from here on out. While I haven't used it extensively so far, preliminary testing seems to confirm that it does what it says it does, and quite well. There are a few minor inconveniences though. The first one being that the jumpers for configuring the amount of panels attached aren't actual jumpers, but pads that are solder-bridged. While it certainly keeps the cost down this way, it makes it somewhat of a hassle to change the setup quickly (unless you're the kind of person who always has a hot soldering iron nearby). The second minor annoyance is that for tuning it right, you have to hold the multimeter probes onto the SET and GND pads, but the pads are so small it's easy to slip off with the probes in one hand while trying to tweak the little knob with the other. Though this could also be the fault of my probes, or my hands. While a bit bare on the side of soldered-on components, it definitely does what you want it to do. I originally bought this for a project specifically running off solar, but I knew I was going to make multiple ones, so cost is a bigger factor than just a one-off. I had to read up on various charging methodologies and how they impact charging speed & battery longevity. On the surface MPPT seemed perfect, but after doing a few sample runs, I settled on a non-mppt solution. Did this board work? Absolutely. Did this board work well? Absolutely. Would you recommend this board? For someone needing MPPT charging, Yes. The board I bought is in service, and doing it's job, and doing it well. I wish it had some better monitoring on-board. (ie: battery status). If you're building one unit and need to pick a charger, this is a great choice, if you're looking to build a bunch where price can add up; mppt might not be the cure-all. Personally, I like the rocketscream boards for when solar charging is needed. This charger was great for me - one feature not described in many chargers is whether the charger will always output 3 volts even if the solar panel voltage goes above that. I tried a few other chips which all listed passing through the panel voltage as a feature. This is actually big design annoyance for 3v devices. However, the sunny buddy will always output max 4v even without the battery plugged in, even when charging , even when the solar panel voltage goes to 15v. Great!